Privacy screens in hospitals could be an overlooked means of disease transmission, research shows. New research shows that contamination of privacy curtains with multidrug-resistant organisms (MDROs) is a common problem and could be a source of disease transmission to patients. 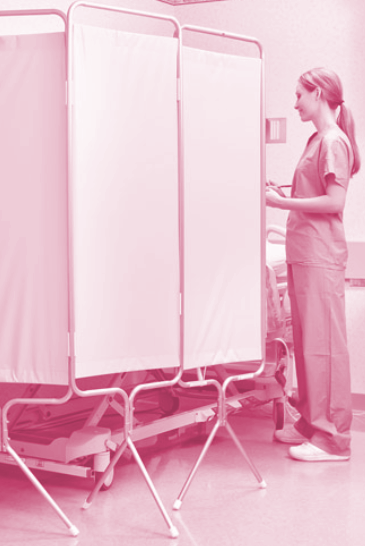 A study at two hospitals in the US looked at the prevalence of curtain contamination with MDROs in skilled nursing facility (SNF) rooms with a view to better inform curtain hygiene protocols. In the US, SNFs care for both post-acute care patients with an average length of stay of 22 days, as well as long-term residents who may be in the facility for up to 2 years. In this study, 95 per cent of enrolled patients were short-stay admissions. Researchers obtained bacterial culture samples from several sites on each patient's body, as well as from high-touch surfaces in the patient's room. Samples were taken upon admission, and again after 14 days, 30 days, then monthly up to 6 months where possible. A total of 1521 samples from 625 rooms were obtained from the edges of privacy curtains where they are touched most often, and the researchers were particularly interested in any links between bacteria found on patients, and MDRO contamination on their privacy curtain at the same visit. The team also wanted to discover whether this contamination occurred intermittently, or was persistent for those patients with 6 months of follow-up. The study found that 22 per cent of cultures taken from privacy curtains tested positive for MDROs. Of these cultures, 14 per cent were contaminated with vancomycin-resistant enterococci (VRE), 6 per cent with resistant gram-negative bacilli (R-GNB), and 5 per cent with methicillin-resistant Staphylococcus aureus (MRSA). The team discovered no statistically significant difference in contamination rates between private and shared rooms. The authors found that in 15.7 per cent of sampling visits, patients and their privacy curtain were concurrently colonised with the same MDRO. The researchers say that their findings show contamination of privacy curtains with MDROs is a common problem, and that patients are frequently contaminated with the same MDRO as their privacy curtain. “We were surprised to see that MDROs, especially VRE, shed by patients routinely contaminate their privacy curtains,” the report concludes.